Dilpreet is a Senior professional with 10 plus years of experience in the field of CRM, Marketing analytics and Customer Insights across varied industries. Currently he is heading the CRM and analytics vertical for The Oberoi Group managing both the brands Oberoi and Trident. 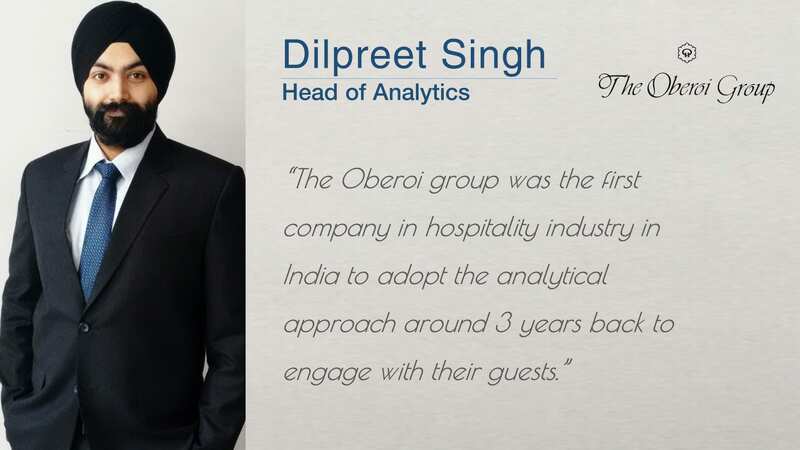 In an interview with Analytics India Magazine, Dilpreet speaks about how Oberoi group is leveraging analytics. [dropcap size=”2″]AIM[/dropcap]Analytics India Magazine: Dilpreet, thanks for this interview. Please tell us more about analytics within The Oberoi Group? [dropcap size=”2″]DS[/dropcap]Dilpreet Singh: Analytics is an integral part of our Organization.The hospitality industry is witnessing aggressive competition due to the economic changes in global markets and with the inventory of rooms available set to increase, the market is set to become more competitive than ever. The analytics needs to be actionable and imparted to draw right information. This is achieved by knowing our guests, mining the data for information, using it to build relevance and eventually monetizing the relationship. AIM: What are some of the analytics solutions that you work on? Please brief us about a specific use case in analytics that has brought significant value to The Oberoi Group. DS: Lot many things pertaining to Customer insights and analysis – starting from analyzing the transactional data, segmentation, predictive models to predict future behavior, followed by various models like repeat, cross-sell, up-sell, churn, customer journey touchpoint, Customer lifecycle management, Lifetime value model etc. What is the best time/day to send the communication. What kind of communication works and what doesn’t. Which guest would respond to which offer. When will a guest make his/her next stay and in which hotel. How much revenue will the guest give in coming few weeks/months and years. Each guest is assigned an engagement score and response score which has helped in designing the campaigns and finding the relevant TG. AIM: When did The Oberoi Group first adopt analytics and what has been the benefits till date? DS: The Oberoi group was the first company in hospitality industry in India to adopt the analytical approach around 3 years back to engage with their guests. The strategic engagement challenge for the organization was how to communicate precisely with huge base of 2 million guests to drive their frequency of stays and brand engagement. The marketing investment has to be best optimized to have a high response rate and also high ROI. We wanted the CRM spends to be more productive and the program to be more responsive. We wanted to achieve this in a fully automated manner using real time analysis to map the most relevant message and offer for every guest. AIM: What are the key differentiators in your analytical solutions? DS: At The Oberoi Group analytics unit is the center of excellence on information and data which has great synergies with the IT vertical. We operate on a very strong technology architecture which enables us to get real time insights which aid in faster decision making. We don’t just work on the statistical models but also emphasize a lot on the messaging and offer in order to reach out to the right guest with relevant communication. AIM: What are the planned next steps/ road ahead for analytics in our organizations? DS: We are working on some key initiatives which will help us in engaging with our loyal guest base in more scientific and effective manner. Also we are leveraging on the technology to engage with our guests in more expressive manner. DS: Some of the key issues which are being faced by not only us but almost every organization is lack of proper data; as Customer details/demographics are not filled out properly. Secondly, in case the data is available then it is in scattered form so it is very important as an analyst to connect the dots and get meaningful information from the raw data. AIM: How do you see Analytics evolving today in the industry as a whole? What are the most important contemporary trends that you see emerging in the Analytics space across the globe? DS: Today everyone is talking about “Big Data” but most of the organizations don’t have any idea about that and they are just following the league. Companies are putting in efforts in data collection but where they are lacking is data integration. Some of the trends which I’ve seen in analytics in recent past are social media integration, predictive analysis models, use of business intelligence tools like Alterian and Cognos, last but not the least is your digital analytics as the world is becoming more advanced. AIM: How did you start your career in Analytics? How has the journey been so far? DS: I have over ten years of work experience across diverse industries such as financial services, e commerce, Food retail and Hospitality. I started my career with Aon Hewitt as a CRM consultant in Health & Group benefit domain, then moved to American express into account management profile catering to multiple regions with expertise in fraud analytics, Risk analytics and Business transformation. The most enriching experience has been with Dominos and The Oberoi group as both the organization are customer centric and data driven with ample support and guidance from the management. The level of customer engagement by leveraging on latest technology and trends is second to none. DS: Customer data is your key to success but only when you know how to use it effectively.